It was good to be back at OSDC, great feedback from OpenNebula users, great organization, and great city (Nüremberg). 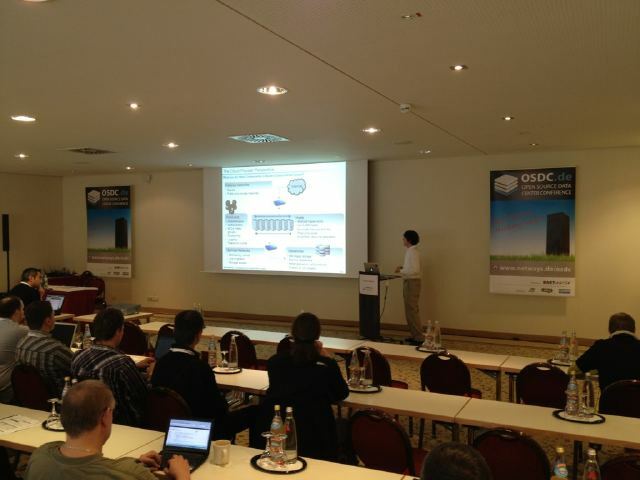 Hope to be back for OSDC 2013! Thanks to @netways for the picture. We are happy to announce that the upcoming Ubuntu 12.04 LTS (Precise Pangolin) will feature OpenNebula 3.2.1. We would like to thank Damien Raude-Morvan for maintaining the Debian package and Fabrice Coutadeur for helping us with the sync request, and the friendly people from #ubuntu-devel in Freenode for helping us out every time we asked. 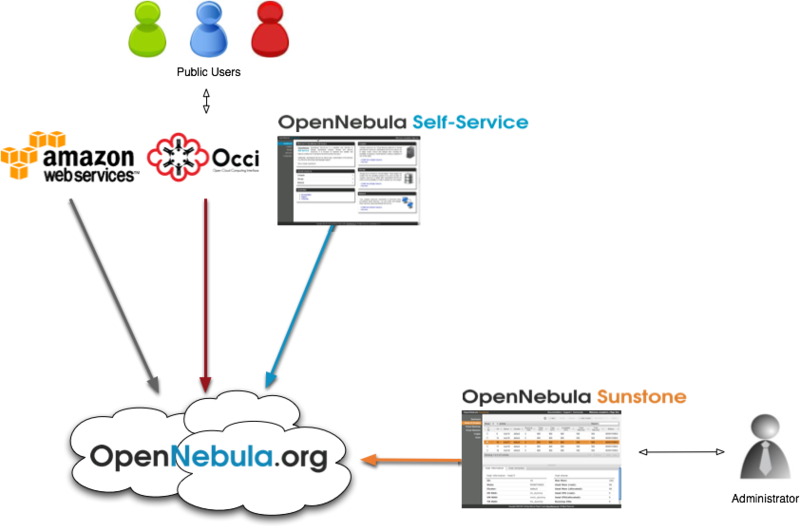 The OpenNebula Cloud offers a virtual computing environment accessible through two different remote cloud interfaces, OCCI and EC2, and two different web interfaces, Sunstone for cloud administrators and the new SelfService for cloud consumers. These mechanisms access the same infrastructure, i.e. resources created by any of the mentioned methods will be instantly available on the others. For instance, you can create a VM with the OCCI interface, monitor it with the EC2 interface, and shut it down using the OpenNebula Sunstone web interface. This Cloud has been migrated to the last OpenNebula version, 3.4. If you have an account you can still use your old username and password. If not, request a new account and check out the new OpenNebula 3.4 features. These interfaces will show you the regular user view of the Cloud, but you will not be able to manage system resources such as ACLs, groups nor users; nor infrastructure resources such as hosts, clusters and datastores, since that will be delegated to the oneadmin group. Operations upon this cloud will result on virtual networks and machines resource creations, but no real action whatsoever will be performed. This means that there will be the illusion that a VM is created, but in fact it won’t be running anywhere. We recently received new langauge contributions for OpenNebula Self-Service, our end-user web interfaces: fr_FR and fr_CA. As happy as we are to receive these contributions, it was too late to include them in the official OpenNebula 3.4 release. But that’s not a problem. In this post we will briefly explain how to install a new language in OpenNebula Sunstone and Self-Service. Go to the relevant commit (example from our Redmine or Github) and pickup the new language files (fr_FR.js, fr_CA.js, fr_datatables.txt, configuration.js). fr_FR.js contains the sunstone translations. fr_datatable.txt contains the tables columns heading translations. Place the fr_FR.js and fr_datatable.txt in the fr_FR folder you just created. Repeat the step with any other languages. Step 4: Replace the configuration tab file. If adding a language for Self-Service, replace /usr/lib/one/ruby/cloud/occi/ui/public/js/plugins/configuration.js with the configuration.js file provided in the commit. If adding a language for Sunstone, replace /usr/lib/one/sunstone/public/js/plugins/config-tab.js with the config-tab.js file provided in the commit. Clearing browser caché may be necessary if the new languages do not appear in the language option select in the configuration tab of the Self-Service or Sunstone interfaces. OpenNebula 3.4 Wild Duck is out! April 11th, 2012. The OpenNebula project is proud to announce the availability of OpenNebula 3.4 (Wild Duck). The software brings countless valuable contributions by many members of our community, and specially from Research in Motion, Logica, Terradue 2.0, CloudWeavers, Clemson University, and Vilnius University. As main new feature, OpenNebula 3.4 incorporates support for multiple Datastores that provides extreme flexibility in planning the storage backend and important performance benefits, such as balancing I/O operations, defining different SLA policies and features for different VM types or users, or easily scaling the cloud storage. Additionally, OpenNebula 3.4 also features improvements in other areas like support for clusters (resource pools), new tree-like menus for Sunstone, or the addition of the Elastic IP calls in the EC2 Query API. As usual OpenNebula releases are named after a Nebula. The Wild Duck Cluster (also known as Messier 11, or NGC 6705) is an open cluster in the constellation Scutum. Datastores. OpenNebula 3.4 is shipped with 3 basic datastores: filesystem to store disk images in a file form and with image transferring using ssh or shared file systems (NFS, GlusterFS, Lustre…); iSCSI/LVM to store disk images in a block device form; and VMware, a datastore specialized for the VMware hypervisor that handles the vmdk format. New Transfer Drivers. Cloud hosts are not tied to a single transfer mechanism (transfer driver) and now can access images from different datastores in different ways, so providing extreme flexibility in planning the storage backend and important performance benefits. Clusters. A Cluster is a pool of resources that includes physical hosts, datastores and networks for load balancing, high availability, and high performance computing. Revamped Virtual DataCenters in OpenNebula Zones. The new VDC is defined as a fully-isolated set of virtual resources within a cluster where a group of users, under the control of the VDC administrator, can create and manage compute, storage and networking capacity. Improved Cloud APIs. More API calls in the EC2 Query and OCCI APIs, more Auth methods, logging facilities and cloud partitioning to route public users to an specific cluster. Hybrid Cloud Computing. Improved EC2 hybrid driver, to support most of the EC2 features like tags, security groups or VPC. https://opennebula.org/wp-content/uploads/2018/11/opennebula_cloud_logo_white_bg-4.png 0 0 Ruben S. Montero https://opennebula.org/wp-content/uploads/2018/11/opennebula_cloud_logo_white_bg-4.png Ruben S. Montero2012-04-10 18:02:152012-04-10 18:21:34OpenNebula 3.4 Wild Duck is out! Here’s our monthly newsletter with the main news from the last month, including what you can expect in the coming months. The big news this month is the release of the OpenNebula 3.4 beta. This release is focused on extending the storage capabilities of OpenNebula, including support for multiple datastores. The use of multiple datastores provides extreme flexibility in planning the storage backend and important performance benefits, such as balancing I/O operations between storage servers, defining different SLA and QoS policies for different VM types or users, or easily scaling the cloud storage. OpenNebula 3.4 also features improvements in other systems, especially in the core with the support of logic resource pools, the EC2 API with the support of elastic IPs, the Sunstone and Self-service portals with new cool features, and the EC2 hybrid cloud driver that now supports EC2 features like tags, security groups or VPCs. As usual, the OpenNebula community has played an active role in shaping this release, and OpenNebula 3.4 includes contributions from Research in Motion, Logica, Terradue 2.0, CloudWeavers, Clemson University, and Vilnius University. The final release of OpenNebula 3.4 is scheduled for Wednesday, April 11. The Cluster Energy Saving system (CLUES): An energy management system for High Performance Computing (HPC) Clusters and Cloud infrastructures that supports integration with OpenNebula. The main function of the system is to power off internal cluster nodes when they are not being used, and conversely to power them on when they are needed. This component was contributed by the Grupo de Grid y Computación de Altas Prestaciones at the Universidad Politécnica de Valencia. A stable version of the Hyper-V drivers for OpenNebula. This latest release includes new features, such as direct connection to Windows Servers nodes without requiring a proxy machine, improvement of CDROM contextualization mechanism, and support for SCSI hard disks. These new components have been developed with the support of Microsoft. Green Cloud Scheduler: A scheduler that consolidates the virtual machines in the cloud such that as few servers as possible are used to run the current workload while the unused servers are shut down. This component was contributed by the Distributed Systems Research Laboratory of the Technical University of Cluj-Napoca. Sebastien Goasguen’s team at Clemson University has worked on adding support for EC2-like Elastic IPs and Security Groups to OpenNebula. You can read more about it, including pointers to their code, in this blog post. Qingye Jiang published a really interesting analysis of several open source cloud communities, including OpenNebula. Finally, the cloud-b-lab blog has been publishing several tutorials on OpenNebula, including tutorials on VMWare, Windows XP, and Hadoop. We will be giving an intensive tutorial on basic and advance usage and configuration of the new OpenNebula 3.2.1 at the Open Source Datacenter Conference (OSDC 2012) to take place in Nuremberg, Germany, on the 25th and 26th of April 2012. Preregistration for the workshop is needed. Remember that you can see slides and resources from past events in our Outreach page. We have also created a Slideshare account where you can see the slides from some of our recent presentations.